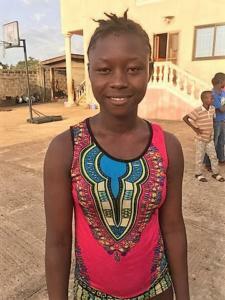 Aminata is one of the 60 children who have been cared for by Restore Hope’s Interim Care Center for Ebola Orphans and Survivors at the Hope Center in Jui, Sierra Leone. She has been at the center for six months. While all the children at the center are orphaned by Ebola, 11 of the children are themselves, Ebola survivors. Aminata is one of those 11. Aminata was very tearful as she recounted her challenging experiences. Please read her testimony below. “Before Ebola came to Sierra Leone, I lived with my family in the village of Rogbangba. I lived with my mother and father and my sister. I loved attending school and was in Class 4. My older sister who was 14 got the Ebola first. She came home sick and all of our family was exposed to the virus. Everyone was afraid. My father got the Ebola next. My sister and my father both died quickly. My mother was very frightened. Everyone was afraid to be taken to the Ebola treatment center because those who go never come back. And so she took me with her and we ran away from the village so no one could find us and send us to the Ebola center. But it was too late. The Ebola had gotten my mother. She became very sick, and she died. My grandparents also got it from her, and they died. Everyone in my family died. I was alone and I was so sad and scared. I had nowhere to go. The only thing I could think to do was to go back to my village. I was going from house to house begging for food — but everyone was afraid of me, and they yelled at me and drove me away from their houses. An old man felt sorry for me and he took me into his house. He was not related to me, but I called him my stepfather. He would go away from the house and leave me in the house alone. So, I was alone most of those days. But I had not escaped the virus. I soon became very sick with fever and with terrible pain in my stomach. Then came the vomiting and the blood. I became sicker and sicker. I became so sick I could not even move. Someone called the emergency Ebola number 117, and the emergency men came to take me to the Ebola treatment center in Hastings. By the time the workers got to me, I was so sick and lifeless they thought I was dead. So they prepared to bury me. They sprayed my body, face and head with bleach. I was unable to respond. They put me in a body bag and zipped it up. They were taking me to bury me in the Ebola grave with the other dead. But the bleach made me cough and they heard me. So they unzipped the bag and transported me to Hastings to the Ebola treatment center. I was placed in a room with 20 other Ebola patients. The room was full of sickness and bleach. One by one, each person was taken out in a body bag. I was laying helpless, waiting to die too. The pain was so strong and my eyes were burning so bad from the bleach they had sprayed in my eyes. Every person in the room died. All twenty of them. I was number 21. The pain in my stomach was unbearable. I was so weak and frightened. I still have very bad dreams, and it makes me cry and scream in the night. I still cannot see well out of my right eye. Only small-small (very little). I stayed in the Ebola center for five months. Many people around me were dying. After the third month, my body began to feel better except I still had the bad pain in my stomach. I was very weak and thin, so they kept me there two more months. When they thought I was strong enough, they took me back to my village. I began looking for other members of my family like my uncle, but none of them had survived. They were all dead. Our family house was empty. No one would come near it. People were so afraid of catching the Ebola. The people feared me. If I came near their house asking for food they yelled at me, threatened me and drove me away. No one would talk to me. They ran from me. Even the old man drove me away from his house. I was so sad and lonely. I didn’t know what I was going to do. I ran back to the house where my family had lived, and I locked myself in and I cried and cried. I was all alone and no one could care for me because they were afraid of me. After some time of keeping to myself and trying to get food for survival, a man from our village who worked for Child Welfare came and found me. He, too, was an Ebola survivor. He had heard about me and wanted to help me. He came and found me and put me in his car. He drove me to the Child Welfare office and they told him to take me straight to the ICC at Hope Center. Again, I was so scared. I began to cry. I did not know what ICC was. I thought it might be like other orphanages I had heard of where children are taken so that they can be sold as slaves. So, when we got to Hope Center, I refused to get out of the car because I was sure things were only going to get worse. I screamed and cried, holding on to the car. Finally, the children came out. They were all together, and they did not seem to be afraid. And they were not afraid of me because many of them were also survivors of Ebola. They said that when I arrived here I was like a mad person. I had lost my mind. But now I am happy. I still sometimes wake up crying in the night. And I scream out in my sleep. But the caregivers and the matrons are here for me. Now I feel safe. The Child Welfare took me to Waterloo to tell my story on the radio because they are trying to help our people understand the hardships we survivors have gone through and how we feel. I do not know what will happen to me when I leave ICC. They say I may have to go back to my village. The old man in my village has tried to help me now that I am well. He took me to a doctor in Freetown about my eyes, but he does not have the money to pay for the medical treatment. They say it is not good for a young girl to live with an older man alone, so I am not sure what is going to happen to me. But Mama Cindy Wiles and Daddy Wiles are going to sponsor me. So, I know someone will care about me. I pray that you get a glimpse of just how devastating this global health crisis has been in the lives or Sierra Leoneans and just how important your interventions have been. I do not know where this girl would be if it were not God using you to provide a place of healing and a path for the future. Thank you . . . thank you. Aminata's story is shared with her permission.